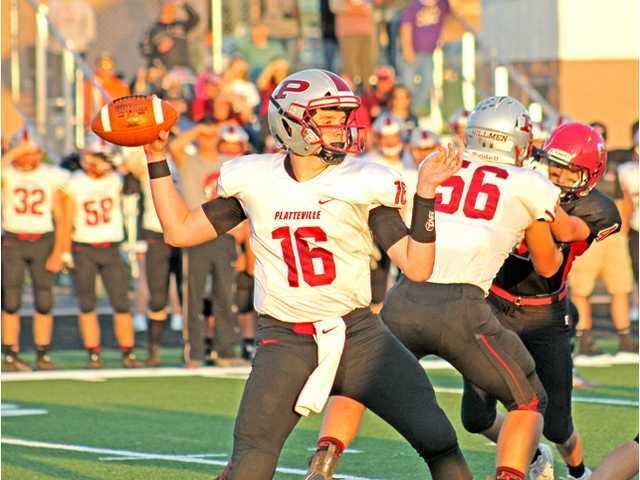 Junior quarterback Tyler McClain passed for 239 yards and three touchdowns — two to senior Connor Riley — to lead Platteville to a 28–8 non-conference road victory at Arcadia Friday night. POSTED September 14, 2018 12:04 p.m.
ARCADIA — The script through the first three games of the Platteville football season was (1) give up an early touchdown but (2) shut out the opponent in the second half allowing for (3) a come-from-behind win. The Hillmen flipped the script against Arcadia Friday night, but the same result as the first three games — a win, in this case 28–8 at Reit Sports Complex’s Cashen Field. Quarterback Tyler McClain threw three touchdown passes, two to Connor Riley on the first drive of each half. Running back A.J. Barner rushed for 116 yards and a touchdown. The Hillmen defense allowed just 104 total yards, 14 on the ground, not giving up a score until the fourth quarter after the Hillmen had a 28–0 lead. The Hillmen (4–0) open their Southwest Wisconsin Conference season at Lancaster (3–1) Friday as the only undefeated team in the SWC after four non-conference games following losses by Prairie du Chien and River Valley Friday, and as the unofficial champion of the five-year-long SWC vs. Coulee Conference non-conference series, having gone 8–2 against the Coulee and beaten every team except Black River Falls. Platteville fixed the problem of falling behind in just four plays when, after a Barner game-opening 11-yard run, a run for no gain and an incomplete pass to Riley, McClain found Riley for a 68-yard touchdown pass, giving the Hillmen, following the first of Quinn Kafar’s four extra points, a 7–0 lead 106 seconds into the game. As in their previous games, mistakes by Platteville’s offense didn’t deter Platteville’s defense. After a McClain interception return to the Arcadia 47, the Raiders moved to the ball to the Hillmen 13, but a fourth-and-five touchdown pass from Tanner Klar to Michael Schweisthal was nullified on an offensive pass interference penalty, and an incomplete pass ended the drive. Platteville’s second scoring drive, nine plays and 70 yards long, included a McClain run for a first down on third-and-1, a 37-yard pass to John Goomey for a first down on second and 16, and then Barner’s 12-yard jet sweep touchdown run, extending the lead to 14–0 with 5:17 left in the first half. The first drive of the game was essentially repeated in the first drive of the second half, with a three-yard pass to Goomey, a five-yard loss on a pass to Barner, and then McClain finding Riley long distance again for a 63-yard touchdown catch with 8:40 left in the third quarter, extending the Hillmen lead to 21–0. Riley then got involved on the pass defense side, intercepting a Klar pas that, along with a facemask penalty, set up the Hillmen at the Arcadia 37. McClain found Goomey for 24 yards and a first down on the first play, and then Niehaus in the back of the end zone for a 13-yard touchdown pass, extending the lead to 28–0 with 4:32 left in the third. Arcadia’s only score came after a blocked pooch punt recovered at the Platteville 30. After a nine-yard run by Tyler Klar, Tanner Klar found Kaden Lisowski for a 21-yard touchdown pass and Schweisthal for a two-point conversion to reduce the lead to 28–8 with eight seconds left in the third. The Hillmen defense made sure no comeback would occur, giving up 17 yards and one first down, on a pass interference penalty, in three Arcadia series in the last 12 minutes. First downs — P 17, A 9. Rushing — P 28-119, A 27-14. Passing (comp-att-int, yds) — P 15-28-2, 238, A 10-22-1, 90. Fumbles–lost — P 1-1, A 1-0. Penalties-yards — P 10-80, A 4-40. Rushing — P: AJ Barner 17-116, Mac Hueber 8-18. Passing — P: Tyler McClain 15-28-2, 239; Tanner Klar 9-18-1, 84. Receiving — P: Connor Riley 4-168, A: Michael Schweitstal 4-35. Tackles — P: Trevor Heim 10, Gabe Tashner 7, Will Schaefer 5.